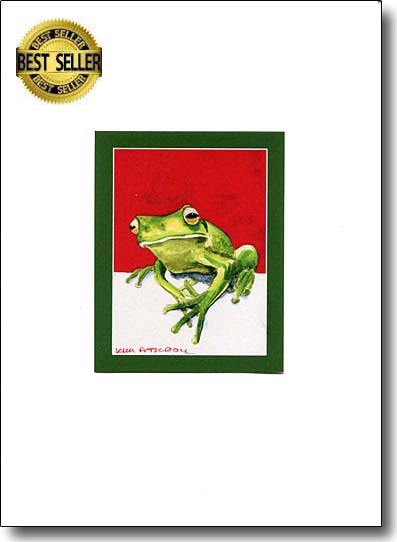 Have fun with these ever popular bird greeting cards and all the other creatures that joined the parade. 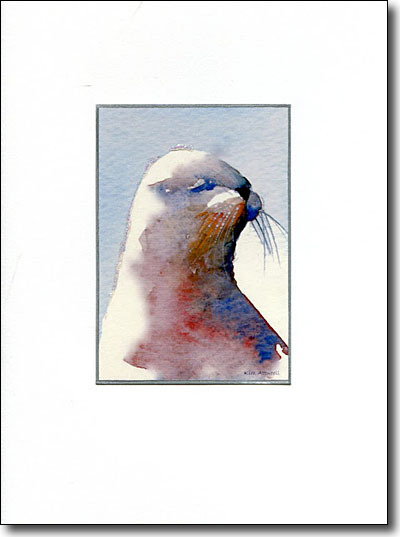 Its silver whiskers glisten and its attitude is apparent. 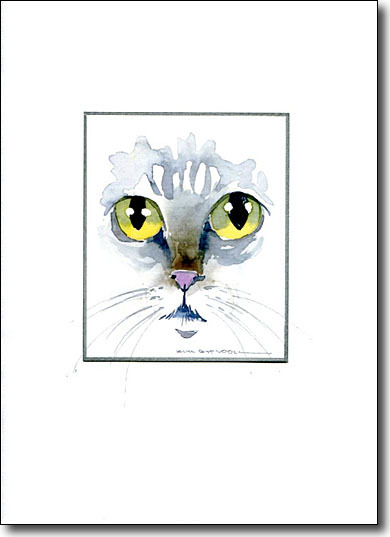 Cat lovers "get" this card. 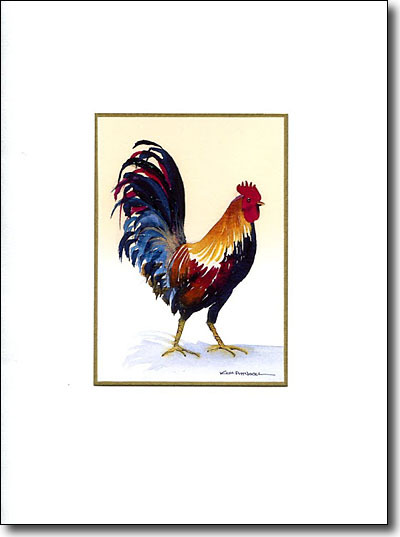 My preening rooster is one of my favorite bird greeting cards. He's enhanced with hologram sparkles on his tail feathers. Every man should have one! Such a positive statement! 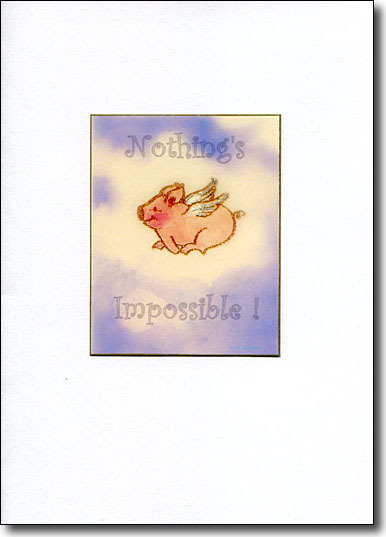 This whimsical flying pig makes it humorous. This popular image is warm and uplifting. The hummingbirds wings sparkle. 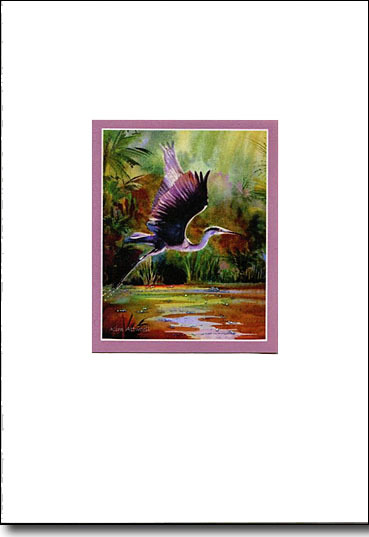 My painting of the great blue heron is embellished on each card with painting if the tall reeds. 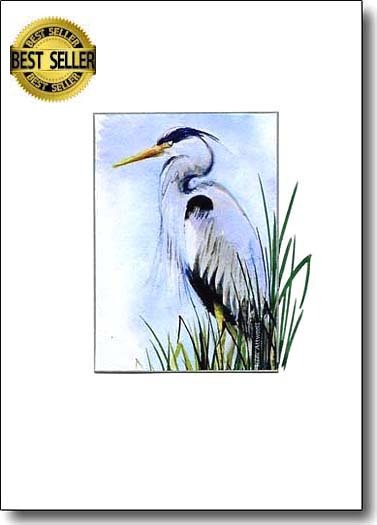 It is a best seller among my bird greeting cards. This greeting card is cleverly produced. I cut away part of my painting giving more interest to the image. Are you smiling? This card always makes me smile. 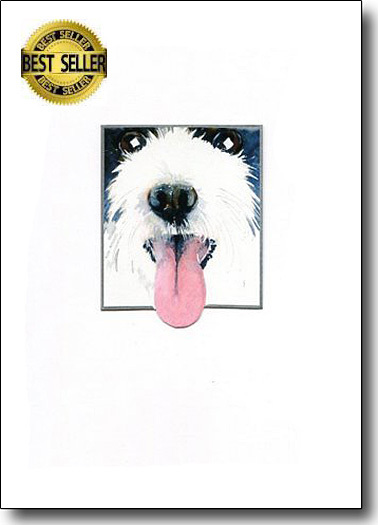 As I embellish it with sparkly whiskers and cut out around his tongue, I feel his enthusiasm and love of life. 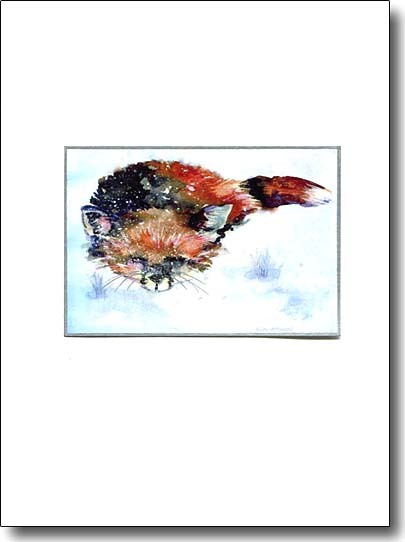 This card shows a fox sleeping in the snow. It seems to touch many people. Perhaps it symbolizes persistence, patience, adaptation. The snow sparkles above the fox and his whiskers glisten in the cold. This glowing image is embellished with raised tall grasses. 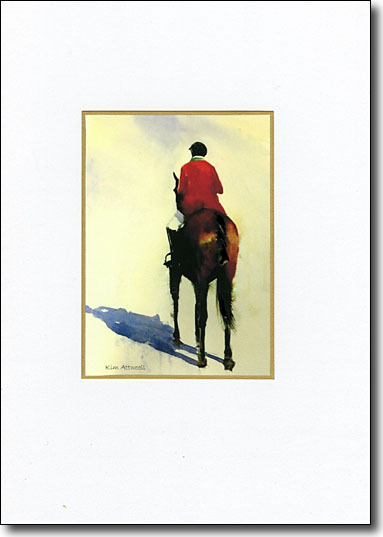 It's a masculine card and is perfect to send to men as a birthday card or Father's Day card. 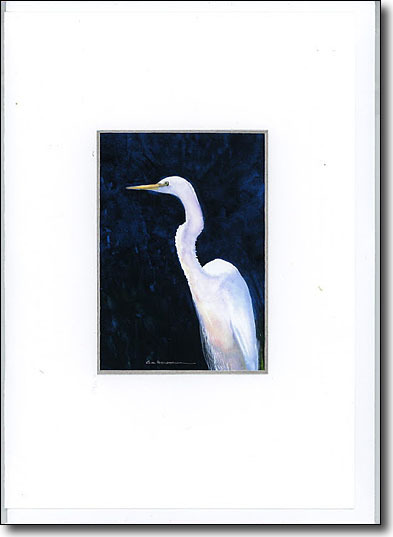 My painting of swans is a powerful image in simple colors. 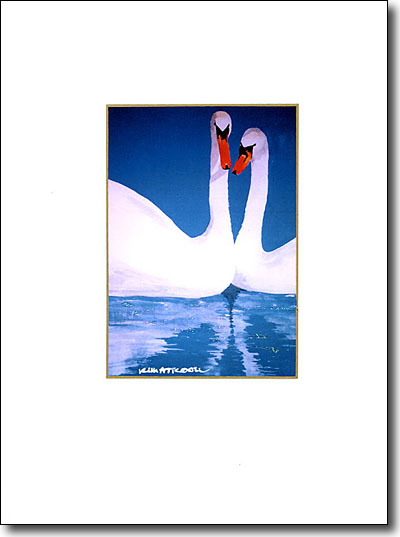 It's a wonderful wedding or anniversary card as swans mate for life. The embellishment is sparkles on the water. 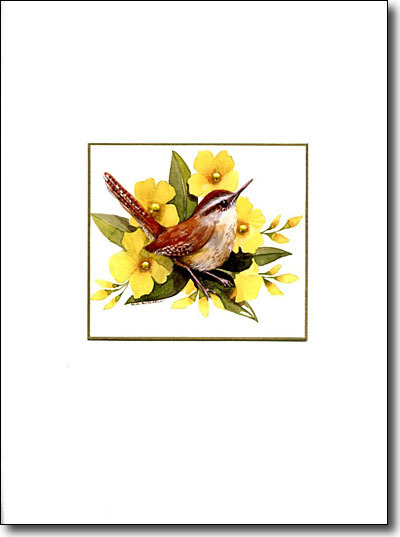 Bird lovers will be delighted to receive this all-occasion greeting card. 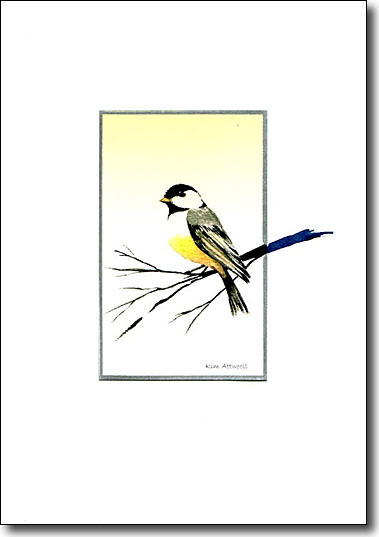 The chickadee is perched on a branch that is painted out onto the card. 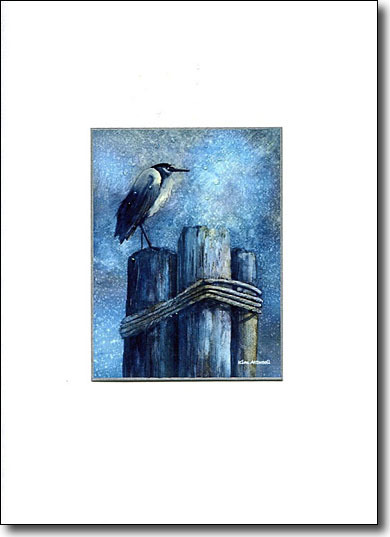 This painting started out as an abstract but ended up as a nest and is one of my most popular bird greeting cards. 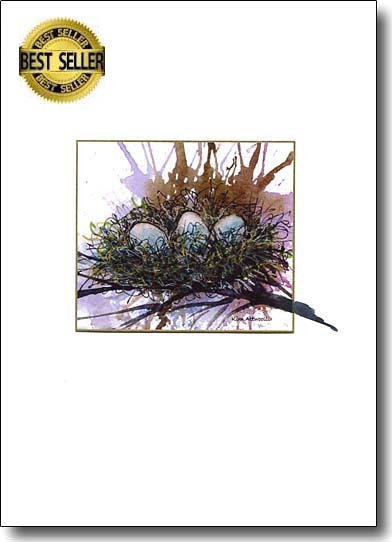 I embellish the twigs of the nest with a touch of sparkle and paint the limb out onto the card. 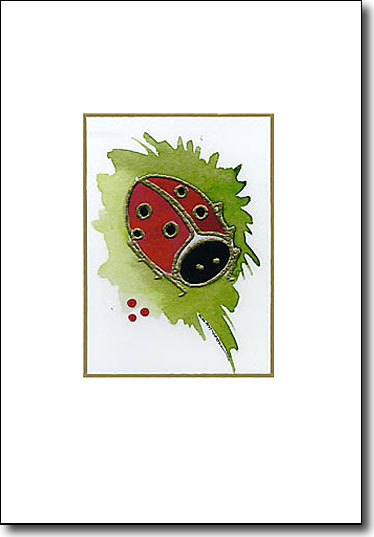 It's a whimsical card to use with the words "Welcome to your new nest". This painting comes to life when I add the bubbles. It will delight nature lovers. 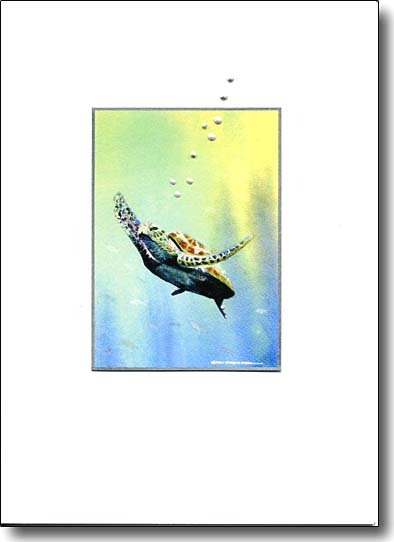 The turtle is a symbol of endurance, strength, longevity and stability. How can you not respond to this green fella looking out at you? The red background was deliberate as they are colors that are opposite on the color wheel and therefore pack a punch when put together. A symbol of luck and love. 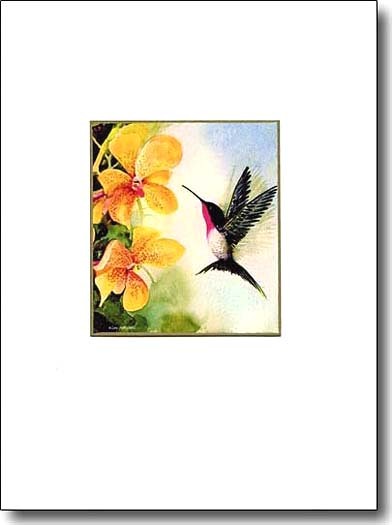 Send this colorful card to special people who grace your world. 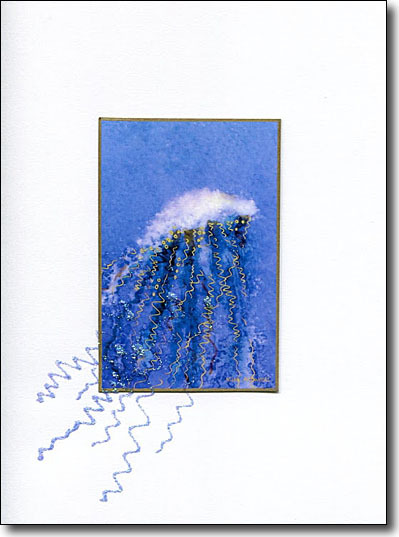 It's a whimsical all-occasions greeting card. What a whimsical character. this plucky bird came out of the image in two places. 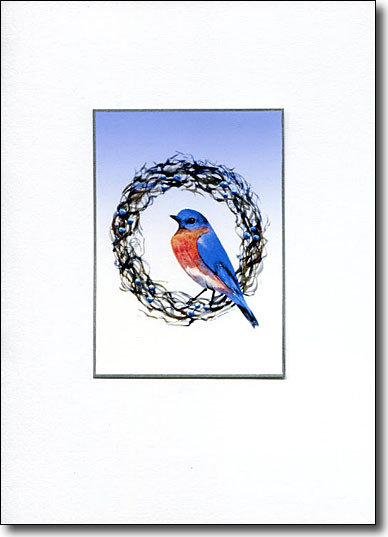 It's an all-occasion card that frames beautifully. A symbol of the northern woods. 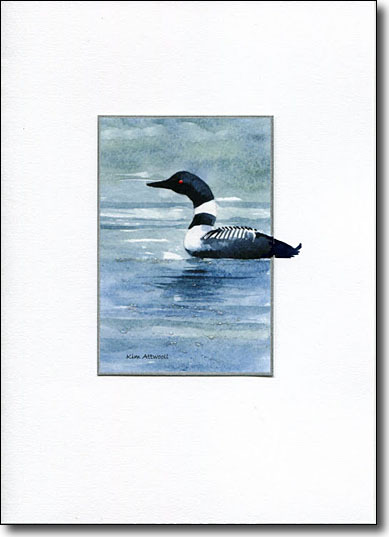 The sound of loons on the lake is known to many. 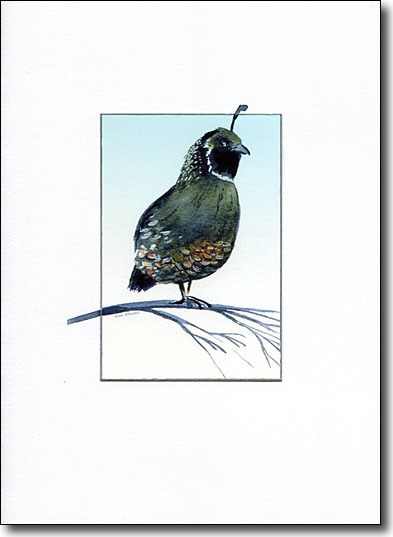 I embellish this card by painting the tail feathers on the card. 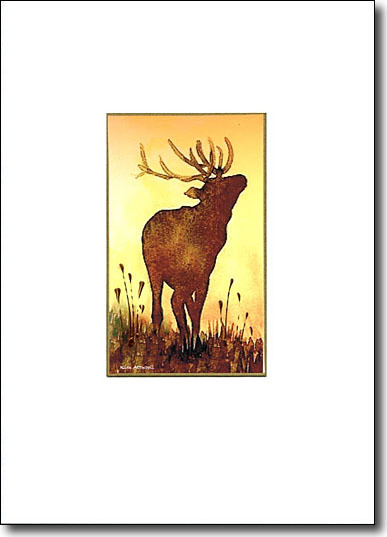 It's the perfect card to send to lovers of lodge and the northern woods. 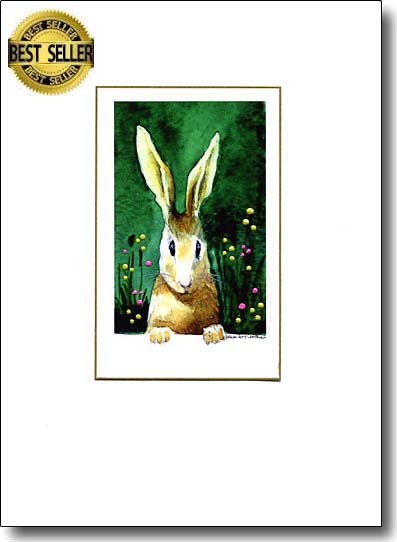 This inquisitive bunny looks out at you with an intensity that will capture your heart. The image is enhanced with dots of color to suggest flowers. It's a whimsical all-occasion card. Bet you have to have one! 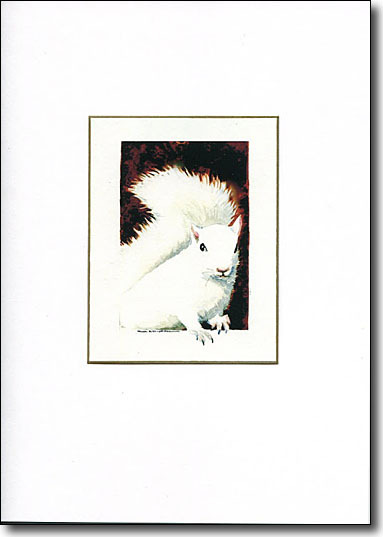 White squirrels are rare creatures. This one is peeking in your window. His whiskers sparkle. 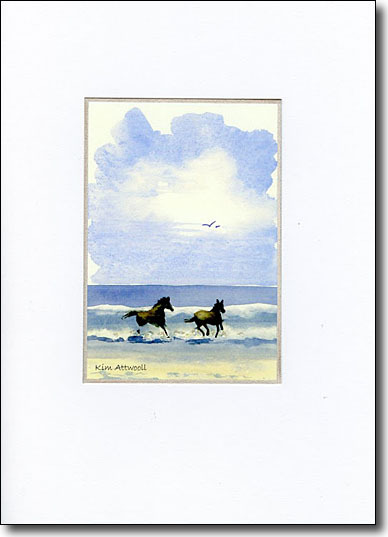 This mall-occasion card will bring a smile to the recipient. A fun greeting inside could be "You're a rare breed!" 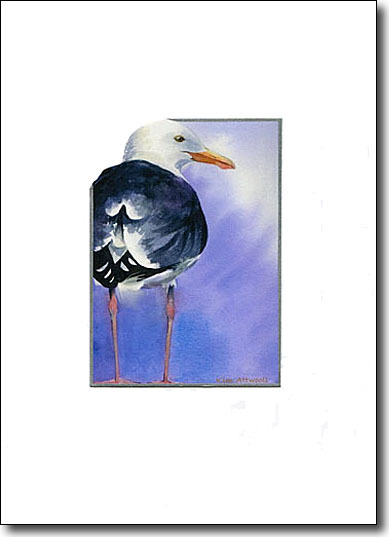 This handsome bird is made more so by the strong contrast that I chose to paint the background with. It's an excellent masculine, all occasion greeting card.